If you don't already have a copy of Jedi Academy for OS X, I'm not sure exactly why you're reading this, but you can get a copy from Steam or the Mac App Store. Any updates are installed through Steam or the App Store, so you don't need the patches for the disc edition. If you have the old disc edition of Mac Jedi Academy, but are on Lion or Mountain Lion, then you can't just run the installer on the disc. Fortunately you can still install the game. 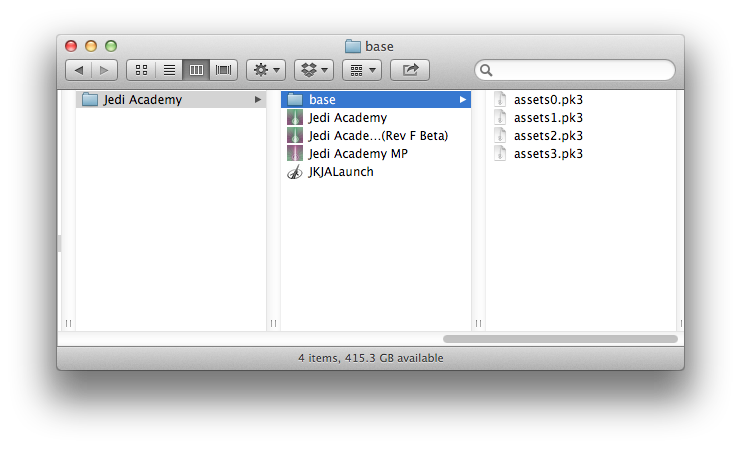 If you already have it installed on an earlier version of OS X you can just copy the Jedi Academy folder across. Otherwise, create a folder somewhere called Jedi Academy. Create a folder inside called base. Copy the assets pk3 files from the two discs into the base folder. Now download the 1.0.1e application and put the Jedi Academy and Jedi Academy MP applications in the Jedi Academy folder you created earlier. For singleplayer you'll also want the 1.0.1f application. I recommend also downloading JKJALaunch, which is a launcher for Jedi Academy that works around some problems on Lion and Mountain Lion with ATI graphics cards. It doesn't really matter where you put it, but for the sake of neatness you might put it alongside the other applications. Opening JKJALaunch will by default launch Jedi Academy MP - if you want to adjust settings or make it open singleplayer instead, you can hold shift down whilst opening it. With the disc edition, the Jedi Academy folder is one place you can put mods, equivalent to GameData for the Windows version. Alternatively, for singleplayer another GameData equivalent is /Users/yourusername/Library/Application Support/Jedi Academy/, which can be reached using Go->Go to Folder…. For multiplayer the corresponding location is /Users/yourusername/Library/Application Support/Jedi Academy MP/. For the Steam version, the game itself is located at /Users/yourusername/Library/Application Support/Steam/SteamApps/common/Jedi Academy/. To access the asset pk3 files, right- or control- click on the application and Show Package Contents. Now open Contents. Inside the base folder are the asset pk3s. Don't do anything with them yet! The Contents folder is one GameData equivalent where mods can be placed, the other, for both singleplayer and multiplayer, is /Users/yourusername/Library/Application Support/Jedi Academy/. For the App Store version, the game itself is located in the Applications folder. To access the asset pk3 files, right- or control- click on the application and Show Package Contents. Now open Contents. Inside the base folder are the asset pk3s. Don't do anything with them yet! The Contents folder is one GameData equivalent where mods can be placed, the other, for both singleplayer and multiplayer, is /Users/yourusername/Library/Containers/com.aspyr.jediacademy.appstore/Data/Library/Application Support/Jedi Academy/. Regardless of exactly what modding you're doing, you'll need a text editor and something for zipping and unzipping files to handle pk3s. TextEdit should do a decent enough job for editing text, but of course any other text editor that can save plain text is fine. The built-in archive handler is able to create pk3 files and unzip them, but you might want to extract just a few files from pk3s or browse the contents of a pk3. Something like Zipeg can be useful for that. Now you should be ready to get started! This article is my 4th oldest. It is 618 words long, and it’s got 37 comments for now.